Griddled Mediterranean vegetables make the perfect 'sandwich' for Mozzarella – assemble the stacks quickly so the heat melts the cheese. Brush the vegetables with olive oil. First griddle the aubergines for 5–6 minutes each side until really tender. Next, griddle the red peppers, pressing them so that they come into contact with the griddle pan, for 4–5 minutes each side, until softened and marked by dark lines. 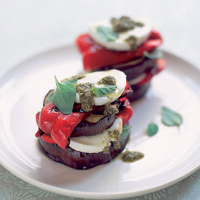 Lay half the slices of aubergine on plates to start the stacks – allow 2 per person, depending on size. To each one, add a couple of oregano leaves, a slice of red pepper and a slice of Mozzarella, then top with another slice of aubergine and repeat with oregano leaves, red pepper and Mozzarella. Scatter with more oregano and drizzle over the pesto.